Our guide in Mandalay was the very popular local guide, John, who has done many tours for our clients in the Mandalay area. I have read many the good comments from our clients about him & John has proved his excellent service to us. Although he uses an English name, John, he is a local Mandalay guy. We will try to use him for all our Mandalay tours. First we visited the Mandalay City hotel. 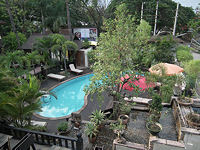 This is a very popular 3* hotel that we have been using in our standard hotel category. As the name suggests the hotel is situated in the city but the hotel is hidden behind the main busy street by an entrance leading into a large & quiet courtyard where the hotel entrance is lined with tropical plants & trees. The street noises seem to have disappeared & stepping into a beautiful garden of ponds & trees. The swimming pool is beautifully laid out & designed with tasteful elephant sculptures around it. The privacy of the pool is ensured by the surrounding plants, trees & greenery. 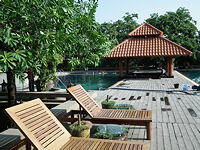 Like the Bay View Resort in Ngapali Beach it has a feel of a private house pool. We are happy to carry on using this hotel for our clients. Next we visited the Mandalay Hill hotel. This hotel has been renovated since we last visited 7 years ago. The hotel is looking more luxurious with the new addition of a lovely spa centre. The walkway in the spa centre is a row of stepping stones across the pond full of beautiful fish swimming under your feet. The centre is also full of tropical flowers & plants. This is a lovely environment for relaxation. If you wish to stay in the spa centre there is a beautiful suite room that is the second most expensive room at the hotel. All the other rooms at the hotel are spacious & beautifully decorated. We are using this hotel in our superior hotel category. The Hotel by the Red Canal was a pleasant surprise - a lovely boutique hotel which is popular with our clients. 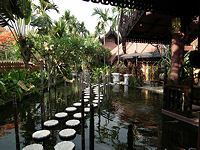 The unique & beautifully designed building in local traditional style is set in a sanctuary of lush tropical gardens & calming water features. Rooms are not large but stylishly designed to fit in the boutique style & local traditional character & culture. The upstairs open lounge is a delight for daily free afternoon tea & snacks. The kidney-shaped swimming pool is beautifully set among the tropical gardens of palm trees & greenery. Like the Mandalay City hotel this is another hidden jewel to relax & enjoy in the middle of the busy city. Finally we arrived at Rupar Mandalar Resort & checked in for our stay. This hotel is called a resort as it is out of the city centre & also because of its environment. The red & brown wood buildings of the resort were set beautifully among the landscaped gardens of trees & greenerys in the late afternoon sun. The beautiful teak wood furniture can be seen everywhere in the garden, lobby, breakfast tables & chairs, corridor pillars & hotel rooms. 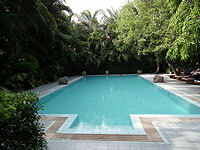 The swimming pool is large & set among the lush gardens. The breakfast outside among the tropical plants & gardens is as good atmosphere as in a beach resort looking out to the beach & sea. The staff here are also providing an excellent service. Next morning we set out on a day trip to Pyin Oo Lwin (Maymyo). 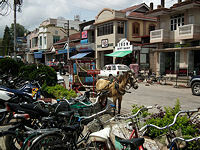 This hill town was established by the British in 1896 to escape the heat of the Mandalay Plain, and is about two hours drive from Mandalay. The remains of the British still can be seen in the form of many faded colonial houses & English churches. We started our visit in the town centre by the famous Purcell Tower built in 1936. There are many horse-drawn carts that can be hired for a ride around the town. The local market is a treat to wander through with its lovely colours of green vegetables, red tomatoes, red strawberries, yellow bananas, green & yellow mangos & fresh noodles all beautifully displayed. John told us that May is mango season & we should try it. Of course many beautiful flowers are to be seen in every market. There is an old railway station in town, still is use despite its shappy appearance. Grass grows between the tracks & local people sleep on the platform. 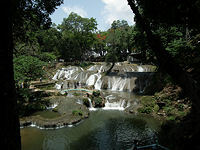 We also visited the Pwe Kauk Falls which used to be called Hampshire Falls in British colonial times. Due to the May Day public holiday we saw many local families here who have come for a swim and a picnic. Next we visited the beautiful Aung Htu Kan Tha Paya with its shinning golden roof. The temple was busy with worshippers as well as preparations for the monks festival for the next few days. This temple has a very touching story - that its Buddha statute was being driven out of the country to China on the back of a lorry, but fell off right at the spot where it is now installed inside a golden pagoda. The people believe that the buddha did not want to leave to country, and so fell off deliberately. John gave us two choices of restaurant for our lunch. One was a local Indian restaurant, a small family eating house which we chose. The restaurant was simple but very clean and pleasant with good tables & chairs and many local customers. We could see that kitchen behind the dining room was good & clean. We sat down & ordered one fish curry, one chicken curry & one meat curry with dall soup, vegetables & rice. They were sensational. They were real south Indian food and every customer in the restaurant ate the same dishes. The naan bread was freshly cooked & tasted wonderful. This is the second best meal I had in Myanmar. This Indian restaurant is called Aung Padamyar. 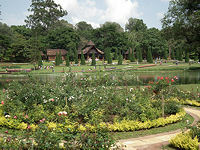 We also inspected a number of hotels for overnight here Pyin Oo Lwin. First we visited the Palace Hill hotel. This is part of the Aureum Governors House. 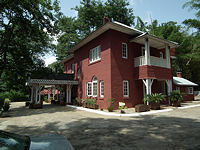 The Palace hill hotel is made up of modern bungalows set in acres of green lawn & gardens. The masterpiece is the English style half-timbered mansion, the Governor House. There are only 5 suites in the mansion. The second hotel we visited is the Candacraig hotel. This wonderful looking mansion is very charming but we were disappointed of the state of the hotel itself which is in dire need of restoration. This was once a club for British officers but now looks sad & haunted. We are unlikely to offer this hotel. 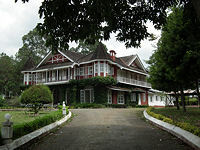 The Kandawgyi Hill Resort was another delightful British old house built in 1920. Unlike the Candacraig hotel this hotel has been renovated into a fine hotel accommodation with a charming historical look. There is a terrace in front of the hotel with lovely views of the gardens & lawns & also the commanding view of the surrounding areas. There are also additional bungalows in the gardens. These rooms are more modern design than the rooms in the old house. We are using this hotel for overnight stays in Pyin Oo Lwin. We spent the rest of the afternoon in the National Kandawgyi Gardens. This park looks like many country parks & gardens in UK cities especially with the display of the bedding plants & flowers. We visited the orchid garden, the butterfly museum & aviary with many exotic birds. Next morning we took a short flight from Mandalay to Heho. This is a small town airport for connection onward to Pindaya, Kalaw & Inle Lake. We were picked up by a new local guide, Aung Kyaw Thu, & drove to Pindaya. We arrived for lunch at a lake side restaurant and later we visited the impressive Pindaya Natural Cave complex. It is high up on a limestone ridge with wonderful views of nearby Pone Taloke Lake & its surrounding area. You can either walk up to the cave by a series of covered stairways or an easier option is to go up by a lift. 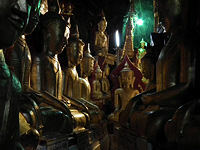 The entrance at the cave is already filled with many different sizes of Buddha images & mostly in shining gold. Every direction I turn I can see golden Buddha images shining upon us. Also behind some Buddha images there are paths leading to different Buddha images & more paths leading somewhere else like a maze. We checked two hotels in Pindaya for overnight stays for our future tour in this area. The first was the Conqueror hotel. We used this hotel few years ago but stopped due to a number of adverse comments from clients. The hotel has very nice & well looked after gardens. 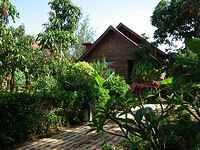 The local style bungalows are spacious, simple & clean looking. It may be possible to use this hotel again. The delightful Inle Inn Pindaya is small boutique style hotel with stone walled bungalow accommodation among tropical gardens. The furniture in the restaurant is high quality teak wood. For a rural hotel it is a very welcome surprise. We left Pindaya & drove to Kalaw.